Warm wet weather has arrived in Kootenays. We toured in the Twin Lakes area off Kootenay Pass yesterday in mild cloudy conditions. 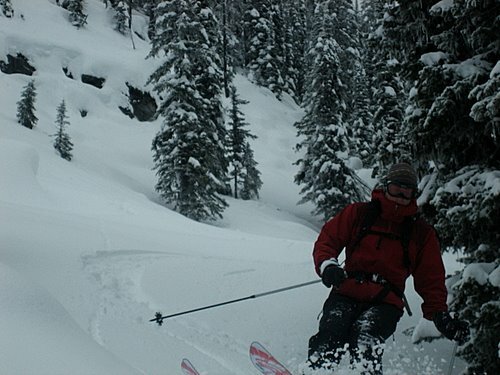 The snow was getting heavier by the hour, and though lots of fun on the steep pillow lines we skied, by the end of the day pin-wheels were forming, tree bombs were dropping, and the snow was wet at lower elevations. We didn’t see any signs of concern regarding stability (other than the warming), though friends skiing off the Camel’s Humps reported pocket releases and whoompfing on the hoar-frost.